Home Lawn & Garden 8 Neat Ways Of Getting A Crystal Clear Swimming Pool! Everyone wants a swimming pool in their house because it adds to the beauty of your home and garden and makes way for awesome parties all year round. Whether you want to throw a summer party with your friends or arrange a barbecue event, your swimming pool would be the main center of attraction. Having a swimming pool is not enough though, cleanliness is extremely necessary. Aside from keeping you and your family healthy and safe, a clean pool can keep attracting more guests and get your neighbors coming back for more parties. The process might seem tedious given the size of your swimming pool, but it could work wonders with the right methods. Also, why would you clean alone? Ask your family members to give you a hand in the weekend. You’ll get a crystal clear pool and as a bonus have some fun family time. You will know when to start pool cleaning if you see that the water has become hazy or is displaying a greenish tint. Remember, whatever the size, type or design of your pool, keeping it clean and safe is crucial for the health of your family members. So, without further ado, I present to you 8 easy ways you can clean your swimming pool. First and foremost, what you should look out for is the chlorine levels and overall water pH. Chlorine is added to kill germs and reduces chances of microbial growth on water. The pH affects chlorine levels and effectiveness. You’ll need to get a water testing kit to measure chlorine and pH. Do this twice a week. The recommended chlorine levels in swimming pool water are 1.0 to 3.0 parts per million, while pH should be slightly alkaline, around 7.2 to 7.6. When chlorine levels are low, make sure to increase it. If pH is too low you can add sodium bicarbonate to increase it. If it is too high (alkaline), add sodium bisulfate or muriatic acid. I cannot stress the fact that how important maintaining the safe chemical level is. Too much chlorine or abnormal pH could cause skin irritations and even corrode swimming pool areas and parts. 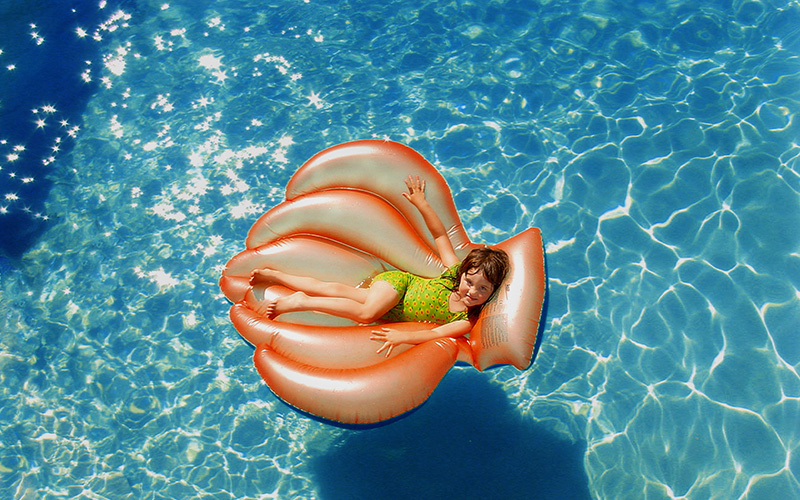 Make sure you let your kids or guests dive into the pool only if it is safe to do so. The swimming pool filter works to keep the swimming pool free from smaller particles, but what about larger objects like leaves or dead insects? If large organic materials are left on the pool for a long period of time, they could break down, creating unusual odor and even getting your pool dirty. The pool will become cloudy sooner or later. Make a habit of removing these kinds of objects every day whenever you see them. The green or yellow cloudy tint on a swimming pool is an indication that your swimming pool is ridden with algae. This can happen despite proper pH and chlorine level maintenance. Every week, give your swimming pool a shock treatment. The shock treatment is basically super-chlorinating the pool so that any microbial growth is destroyed. Pool shock treatments can be found in supply shops. The shock treatment depends on the size of your swimming pool, so read the instructions given in the manual carefully. Allow the shock treatment to sit for 24 hours. Then clean the pool and check pH before using. If the swimming pool corners and walls show signs of algae growth, add algaecides. Also do some scrubbing around the walls regularly because this will stop algae growth. The swimming pool filter is crucial for maintaining a clean pool. To ensure that the filter works all the time you should give it a good backwash. This is running the water through the pool system in the opposite direction instead of the usual, to clean out filter clogs. The water might appear cloudy at some point. To reduce cloudiness you should check the pool pressure gauge readings. Backwash the pool if the pressure per square inch is 5 to 7 units above the normal level. The pool filter as well as the filter catridge could very well be the real culprit. You should make a habit of cleaning the pool filters and these filters can be readily disassembled. Then use a scrub brush and lots of water to remove the clogs. Before you do that, I suggest that you take a look at the manual instructions for the pool filter, since different pools can have different filters. This could also help you decide when to replace your filter. Water is ‘hard’ when there is excess calcium or magnesium deposited in it. You’ll often see white patches forming on your swimming gear and swimming pool walls. They might even look etched. You can determine water hardness with test kits available in pool supply stores. Use a test strip according to the manufacturer’s instructions. Wait till the color changes. The ideal water hardness level should be somewhere around 200 to 400 parts per million. The place you live in could naturally have hard water systems underground, so you should consult a pool professional on whether you need to drain a portion of your pool water or not. For areas where hard water is normal, the common practice is draining out half of the water every year. Then the water level is restored by adding softened water. If the water hardness has not reduced by then, you must add a commercial hardness reducer. Walk around the pool and add the hardness reducer as you move along, of course, based on the package instructions given. Then turn the pool pump on and keep it on for 24 hours. After this treatment keep the pH level around 8.2 for five days. You can do that by adding borax. Test the water hardness after a week. If the hardness has not reduced yet, repeat this treatment again. Take your pool cleaning task to the next level by getting yourself a pool vacuum system. You will have to install the vacuum system to the filter system, whether the pool is above ground or an in-ground pool. Make sure to check for any cracks or dents in the pool before attaching the vacuum system. Pumps circulate pool water through the filter to remove particles and other debris, and then allow clean water back to the pool. This also helps in the proper distribution of any chemicals or treatments you may have added to the pool. You should wear gloves and protect your eyes while working with these kinds of chemicals. These chemicals can irritate your skin upon contact, so seek immediate medical attention if that happens. In case of extreme cases, such as swimming pool leaks, damages or cracks, you should contact a pool professional to solve these problems first and only then think about cleaning your pool. Cleaning your swimming pool is absolutely necessary for a healthy home environment. Remember that pool equipment should be handled with care and precaution. You should not allow your children or pet to come in contact with pool chemicals. Make sure they are far from the pool during these treatments. Manual cleaning around the pool might sound and look tedious, but you do not need to do this on a daily basis. Just once a week of pool treatment, cleaning, and proper filtering can work wonders for your swimming pool. Who does not love a clear and clean swimming pool? It is not too hard to achieve one. Always prepare and check your pool before you arrange any pool parties or events. Next articleCleaning Your Pool Filter Cartridge: 14 Simple Steps!